Hi, everyone–guest blogger Katherine Curry again. Last Saturday morning, I stopped in the Briarcliff Indoor Farmers’ Market, which is held at the Briarcliff Congregational Church. 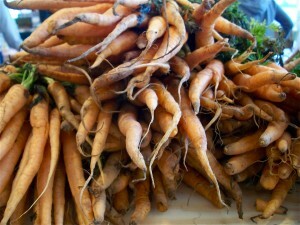 The market runs every Saturday from 9 a.m. to 1 p.m. through May 22nd (it’s closed April 24th). I wish I’d gotten there earlier, because at 11 a.m., it was packed. By the time I got there, Bread Alone was living up to its name– they had just a few lonely loaves of bread. Look how empty the counter is! 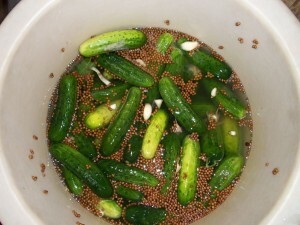 I stopped by the ubiquitous but delicious Pickle Licious for some of their new pickles, which are crunchy and not at all sour. They’re pickles for people who think they don’t like pickles. 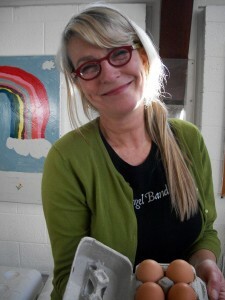 Feather Ridge Farms had fresh eggs, which are hard to come by this time of year. For breakfast on Sunday morning, my daughter and I each had a fried Feather Ridge egg. The yolks were so bright and flavorful. That’s Feather Ridge’s Nancy Austin, below. If I’d gotten to the market sooner, I could have bought one of Feather Ridge’s fresh — not frozen — whole chickens. This coming Saturday, I’ll be there at 9 a.m. sharp to make sure I get one. 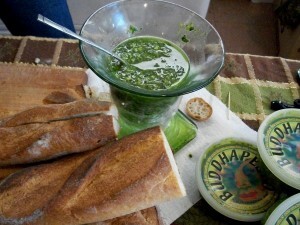 I tasted a sample at Buddha Pesto. It’s wonderful to see that green basil color this time of year. 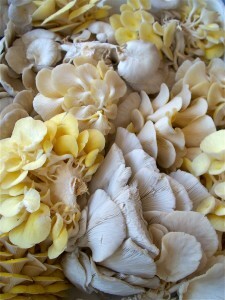 Wiltbank Farm, from Saugerties, was selling some absolutely gorgeous mushrooms. I took home a small basket of shiitake mushrooms. These are their oyster mushrooms. 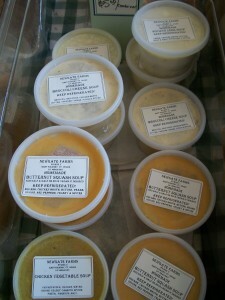 Newgate Farm, from East Granby, CT., was there with a nice selection of soups, like butternut squash and potato leek. I bought a container of their homemade applesauce, which is bursting with flavor. I warmed some up at home and it tasted like apple pie in a bowl. Gajeski Produce had lovely salad greens, sold by the pound, and pretty baby carrots. All wonderful vendors, and I’m not even mentioning half of them — Pika’s Quiche is there, Dines Farm, Meredith’s Bread, Kiernan Farm with their grass-fed beef, and many more. 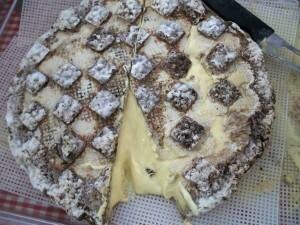 That’s their Endgame 2008 cheese, made with late autumn cow’s milk, which has extra milk fat. Beyond being an impressive sight (the cheese is about the size of a small pizza), Endgame is delicious. It’s so creamy that it’s almost drippy. The initial taste is kind of like a roundhouse punch — this cheese has a very assertive flavor at first, but then it mellows. Bobolink cheesemaker Jonathan White suggests adding a ripe bit of Endgame to the bottom of a bowl of lentil soup. He told me by email that the cheese “melts and swirls as you stir, like butter mounting a sauce, but with attitude!” Endgame will be out of season in a few weeks, so if you don’t find it at the market, ask for Jean-Louis, another very soft, boldly-flavored cheese. I also bought a few Honeycrisp apples from Migliorelli Farms, perfect with the cheese and some bread. 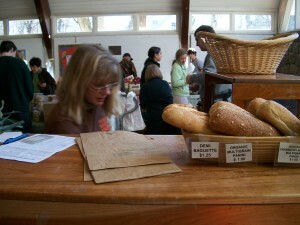 For a round-up of all the indoor farmers’ markets in the area, check out Liz’s article here. 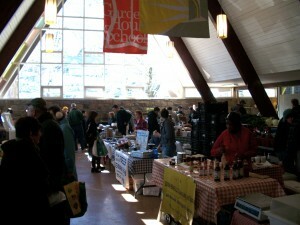 Briarcliff Indoor Farmers Market every Saturday from 9 a.m. to 1 p.m. at the Briarcliff Congregational Church in the Parish House, 30 S. State Road. 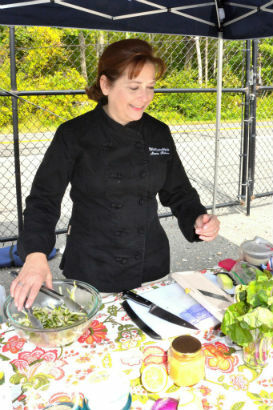 Seasonal Chef Hits the Farmers Market Trail! 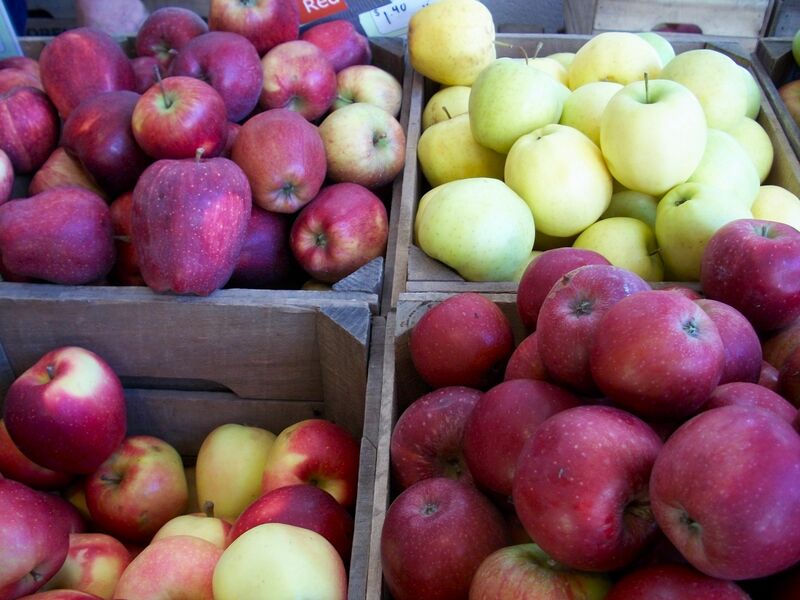 We got delicious, enormous honeycrisp apples there on Saturday. There are different vendors there on different (alternate?) weeks, too. Katherine, we got there even a bit later and sampled what we could at many of the same stands. We opted for a chunk of Bobolink’s Cheddar, it is quite delicious and on the strong side which I like. Nice to have Bobolink here. Also picked up a rustic cheese bread that we are still finishing off. 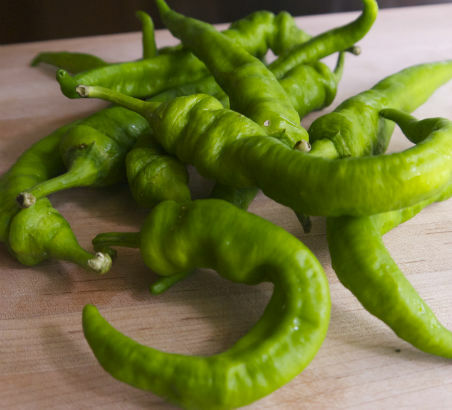 Gajeski is real good too and got to know them during the summer at the NY Botanical Garden Farmers Market in the Bronx. Great stuff! Briarcliff is a good, compact market space.